Machig Lardron was a famous female 11th century Tibetan tantric Buddhist teacher. Her birth was predicted by Yeshe Tsogyel. She was as mystic and shaman. She wanted to know how to end human suffering. She wanted to wake up so she could heal the suffering in the world. So she asked her teacher at the time what was the best and fastest method of achieving this. This is what he told her. She followed it to the letter and gained much spiritual power. And you can too. Each slogan amounts to the same thing. Facing your fears. 5. Where am I afraid to go to in the real world and where and I afraid to go in the dark recesses of my mind. As a spiritual practice of mindfullness examine each fear you have and face it. What is this dark side telling you. There is tremendous benefit in facing fear rather than running from it. You will gain a confidence no one can ever take from you. You will be a guiding force for yourself and for others to emulate. There is so much strength in you that you don’t take credit for. Do it now. See fear for what it really is. Lies. Don’t believe the lies. Don’t believe you can’t do something. There is nothing that cannot be solved. You are more powerful than any trouble. Use your own power. You can do it. Believe in yourself and do it now. I would like you to meet Jessica Whitley. I have known her for quite a few years now, as my daughters swim coach at her alma mater John Jay College of Criminal Justice. Jessica is a dedicated coach and director, she has motivated many teams, my daughters included, to win college championships and serious college competitions. She builds the all girls swim team to understand what it means to be a team and work together to be winners in the pool and out of the pool. She also maintains a professional and positive attitude with the team that the team absorbs. Jessica has such a positive attitude and a superior motivator that after graduation my daughter joined her as assistant coach. Let’s get to know Jessica better. PSW: How did you become a college swim coach? JW: Nothing quite beats the thrill of a competitive swim race! I am a former swimmer who decided to become a coach after calling time on my competitive career. 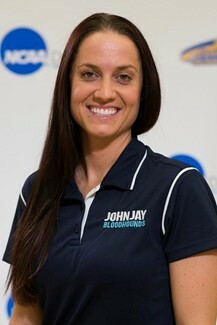 Becoming a college swim coach was not on my radar until I attended John Jay College for my master’s degree. I met Dr. Jane Katz poolside, where I lifeguarded a few hours per week. Suddenly, Dr. Katz husband passed away and she had to take a leave of absence. The head of the physical education department read through my resume and wanted me to take over her college swimming classes as well as coach the swim team. After meeting the very few ladies on the team, it amazed me to see that the swimmers were able to attend full time school, have a full time job and support their families at home. Coaching is more than telling the athletes to complete practices and swim fast at meets, it is about the coach believeing in the athletes so they feel important and appreciated. I quickly realized that my knowledge of swimming and being a Seton Hall Graduate can really make an impact these your athletes in a positive way. I decided to commit myself to the team members and make them understand that swimming well guide them to a successful careet, structure their lives, and their therapy when they need it. PSW: How long have you been a college coach? JW: I am in my 8th season now. PSW: What is your day like? JW: My day starts at 4:15 am. I reside in PA so it takes me about an hour and a half to get to work. I start at 6-6:15 and begin planning for the day. Practice is from 8 to 10 am. I am also the Aquatics Director so I maintain, schedule and operate the pool. I have a lifeguard and staff of 7 that I scheducle and train. PSW: What are your job duties? JW: Women’s Swim Team Coach responsibilities are: team training and the focal point for all new activities. I work extensive hours to coordinate all team practices and clinics. Collect and summarize team statistics and attend numerous away clinics to gain more knowledge. As Aquatics Director I manage the pool facility, oversee the pool, lockers and deck area, Oversee a staff of seven. Plan and host events that occur in the pool area. PSW: What are the challenges of being a college swim coach? JW: The challenges of being a college swim coach are the athletes not buying into my program and not seeing the benefits right away. I have to gain their trust and let them know that there will be a positive outcome throughout and at the end of the season. My yearly goal is to have 100% success rate both in the pool and in the classroom. With hard work and support, the athletes will see a major difference from start to finish. PSW: What are the benefits? PSW: Are there opportunities for advancement? JW: There are many opportunities for advancement. I started as a lifeguard, became an Adjunct Professor and Head Coach, moved up to Aquatics Director and Head Coach. There are always opportunities at any workplace, you just work hard and prove that you are doing your job and doing it well. PSW: Do you have any hobbies? JW: I do like to run. Ever since I completed my four years as a college athlete, I enjoy running. I also play with my dogs and cats. I am a family person and enjoy being in my new home with the people I love. PSW: Describe your team assistants and team members? My team members are students. They enter college struggling (all students do at any college) and learn how to organize structure and gain strength to complete a four year degree. They are hard workers, exceptional students and great athletes. PSW: Are there any special rules to be in a team? JW: Yes, you must be a full time student. You must swim a 50 (2 laps) freestyle under 45 seconds. You must be able to commit to all practices and meets. You must have a yearly physical done. You must keep your GPA above 2.0. PSW: Do you have any advice to those who want to be a college swim coach? JW: My advice, for any job, would be to set a goal and complete that goal. A realistic goal is important. Pay attention to your strengths and weaknesses and focus on improving both. Fight for what you want in life and never, ever give up. With or without support, you can meet your goals. Surround yourself with people who are positive and continue to be who you are and be open to critiques. No one is perfect. PSW: Thank you so much Jessica. I especially like your advice of fighting for what you want in life and never, ever give up, with or without support. And be open to critiques because no one is perfect. Jessica Whitley is a role model for anyone who wants to advance in both their career and life. Jessica teaches all who come into her world how to be better than before. Her enthusiam, dedication and care is rare. She is an exceptional teacher and wonderful human being. I hope Jessica Whitley is an inspiration to you and you will take some of her advice to change your life. she went to the river in the dark and prayed: Mighty river, restore me to my sanity, restore me to my strength. Let me leave my childish ways behind and end victim mentality. The river glistened and shimmied and rode the words away from her and she was healed.